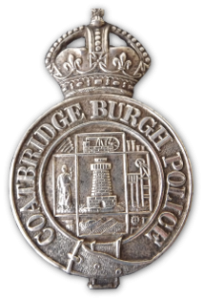 Coatbridge Burgh Police was established in 1886 and ceased to exist in 1967 when it amalgamated with Airdrie Burgh, Hamilton Burgh and Motherwell & Wishaw Burgh to become part of Lanarkshire Constabulary. The first recorded numbers of officers was in 1897 which showed that the force had 33 officers. In 1900 this had increased to 36. The final establishment in 1967 was 102 officers. The Burgh coat of arms has a tower in a centre square. Above in a rectangle is a water pump. To the right in a rectangle is the top of a mine shaft with its wheel. Below is a rectangle depicting hills. To the left, again in a rectangle, is a saint holding his left hand in benediction. In the North West corner are what appear to be four arrows. In the North East corner are four columns. In the South East is a cog wheel and in the south west an anvil.